Location: 38 15 30S 143 30 00E (external link); 7621-4-3 (Warrion) 7621-3-4 (Colac) 7521-2-1 (Nalangil) 7521-1-2 (Wool Wool) 200530. 12 km NW of Colac. Corangamite Lake Road and Red Rock Road. Colac. A 'virtual aerial tour' of Red Rock (Alvie) is provided in this video clip. This low quality video clip runs for 47 seconds and is 1.6 MB in size, which will take some time to automatically download if you are using a slow internet connection. We also provide a high quality version of the clip, and to view this you need to click on the 'HD' button that appears in the navigation controls for the player. This high quality version of the clip is 5.3 MB. Land Tenure/Use: Mainly private land. 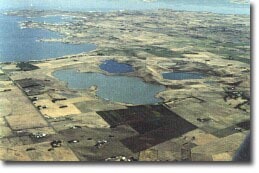 Lake surfaces are public land. Public road to two lookouts. Four sets of operating and disused quarries. Extensive exposure of pyroclastic materials i.e.scoria and tuff. Red Rock is one of the most complex eruption points in the Newer Volcanics Province and includes maars, tuff rings and scoria cones with a basal lava flow from another source (probably Warrion Hill). Up to 30 eruption centres have been mapped in the area measuring 4 km by 3 km just south of the township of Alvie and there are several small eruption points just north of the township. The eruption sequence includes an initial extended phase of maar and tuff ring formation with minor intervening scoria phases when phreatomagmatic activity declined due to depletion of groundwater. 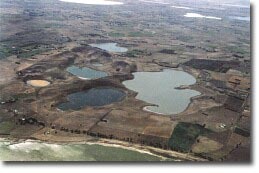 There are nine entire craters up to 75 m deep, some containing lakes including Lakes Purdiguluc, Werowrap and Coragulac. Lake Purdiguluc is formed by at least five coalescing eruption points. Following the maar activity there was an extended phase of scoria eruption in the north around Lake Werowrap which buried part of the maars and tuff deposits. On the basis of a single radiocarbon assay, a date of approximately 8,000 years has been advanced for the age of the Red Rock tuff eruption. International: Red Rock is the most concentrated cluster of eruption points known in the Newer Volcanics Province. It shows a variety of eruption mechanisms and the craters and cones are in an excellent state of preservation. Ollier (1967a) advanced Red Rock as the type locality of “Red Rock Maars” i.e. overlapping multiple eruption points. Although the age is uncertain, it is clearly one of the most recently active volcanoes in Victoria. Of particular interest is the interleaving of volcanic ejects and lake and lunette deposits. References Skeats, E.W. & James, A.V.G. 1937. Basaltic barrier and other surface features of the Newer Basalts of western Victoria. Proceedings of the Royal Society of Victoria 49, pp. 245-278. Hills, E.S. 1940. The physiography of Victoria (1st edn). Whitcombe & Tombs, Melbourne. Ollier, C.D. 1967a. Landforms of the Newer Volcanic Province of Victoria. In J.N. Jennings & J.A. Mabbutt (eds), Landform studies from Australia and New Guinea. ANU Press, pp. 315-339. Gill, E.D. 1978. Radiocarbon dating of the volcanoes of western Victoria, Australia. Victorian Naturalist 95, pp. 152-158. Cas, R., Allen, R., Bull, S & Sukhyar, J 1984a. The Red Rock volcanic complex. Volcanics Workshop 1984, Monash University, Melbourne (unpubl). Red Rock (Alvie) viewed from the southeast.